In my last post, I said that I would attempt to make a doll’s dress in a week and then post my results up here. Those of you who read this blog regularly might have noticed that I’ve not posted for over a week now. That’s because during the week in which I was going to sew a dress, I actually went to Devon. Which I knew I was going to be doing when I wrote the post. Sometimes I baffle even myself with my idiocy. So, the dress is half made – but it is in progress which is still something worthy of a celebration and the content of a post for later. Today I wanted to talk briefly about my trip to Devon and in particular about Goodrington Sands. Goodrington Sands is a stretch of beach in Paignton, and it has the richest rock pools I’ve ever come across. We regularly go rock pooling with the kids in the summer, searching for crabs, little anemones and other sea life in the still pools of water left behind when the tides are low. In Robin Hoods Bay, we’ve had some success at finding crabs and limpets, but nothing much beyond that. But at Goodrington Sands, I saw so much more. Starfish, anemones, hermit crabs, blennies and sea urchins to name but a few. We even saw an anemone on a hermit crab shell, in a real life version of Julia Donaldson’s beloved children’s book ‘Sharing A Shell’ which was a brilliant moment for me. I know the words to that book off by heart, because of the number of times I’ve read it! The Seashore Centre, right on the edge of the sands, and run by the Torbay Coast and Countryside Trust, was a great place to learn a bit more about the things we’d seen. 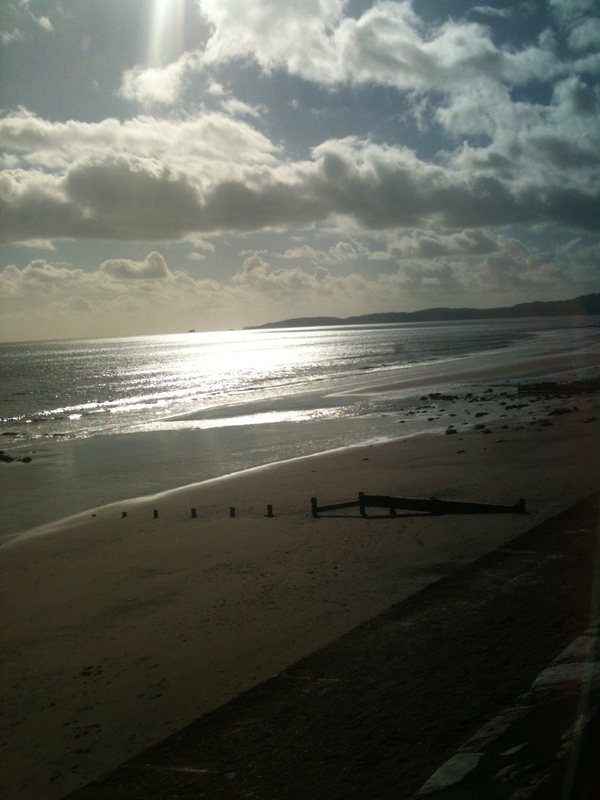 The view through my train window. Obviously, please be responsible when you’re out rockpooling – be careful on slippery rocks and seaweed, and make sure you don’t take any sea creatures away. Don’t keep them out of water and always carefully return them to their habitat. 4 Responses to Goodrington Sands, Devon. Thank you! They’re only from my phone. I really do need to buy a decent camera. 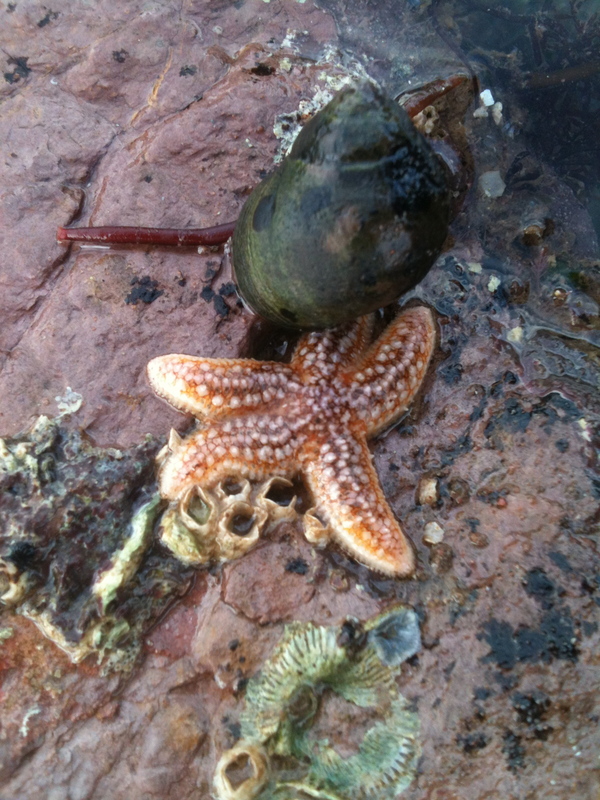 Love rock pooling, we used to spend hours as kids doing exactly that. In fact I think we had more fun and preferred rocky beaches to ones with miles of sand. Haven’t been to this part of Devon though so will keep it in mind. It’s a great little beach. There’s not much else there, apart from a little ice cream place, but I’ve really never seen better rock pools. It’s worth an afternoon of your holiday, I think!